The header is an important part of a website page. It plays a major role in drawing people’s attention towards the rest of the content onto that page. Hence, the need to insert an appealing header design to the very front page of a website. Materialis PRO comes in handy, with 15+ predefined header designs for you to choose from. 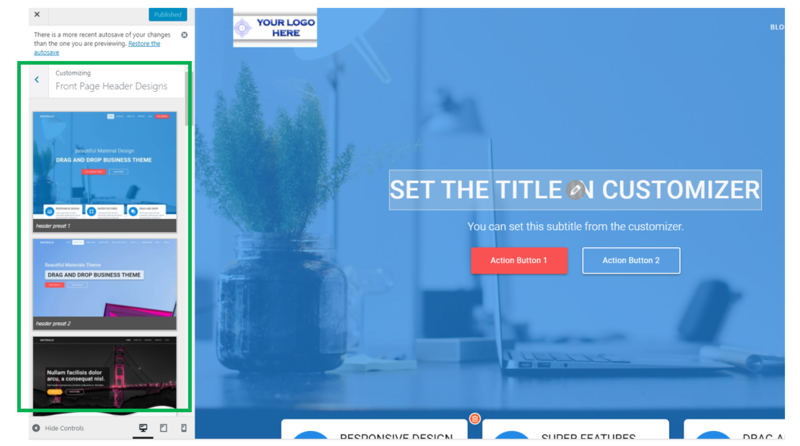 To access the complete list of header designs, enter the Customizer, and click on the first section, marked in blue: Front Page Header Designs. You will have to scroll down the list, until you find the most appropriate design for your business. As you can see, the header designs that are available for use here have been properly chosen to reflect business presentations. According to your business type, you will make a selection that is suitable for your particular niche. To visualize each header design at a higher resolution, click on the magnifier on the right-hand bar next to the header designs in the list. After having made a careful choice, hover over the header design to the center of the image and click on Apply Preset. The default header design will be replaced with one of your own choice, perfectly reflecting your specific business.